We offer the best of Mini Laser Engraving And Cutter Machine to the international market. Our Mini Laser Engraving and Cutter Machine is assured with some striking features such as high precision, optimum performance and compact design. The machine is widely used in craft work; to engrave glass, wood, rubber and granite etc. 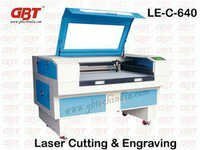 Mini Laser Engraving And Cutter Machine we offer is used a lot in making artistic gifts, billboards, paper-cut and crystal ornaments. Also, we are a prompt Paper Cutter Machines Supplier in the market. Our offered Paper Cutting Machines are designed with modern-day technology and as per the industry set norms. As we strive towards the utmost and unique quality, we are a leading Heavy Duty Paper Cutter Machine Exporter from India.